As a result of the outbreak of World War I, ‘classical’ phonographic field research came to be greatly limited. Rudolf Pöch, Professor of Anthropology and Ethnography at the University of Vienna, however, realised that the war situation would prove ‘an unprecedented opportunity for academic research’. 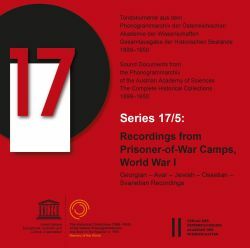 Together with musicologist Robert Lach he exploited this opportunity in order to make extensive language and music recordings of ‘almost all peoples of European and Asian Russia’, especially in the prisoner-of-war camps at Eger (Cheb), Reichenberg (Liberec) and Theresienstadt (Terezín) in Bohemia (today’s Czech Republic). This undertaking with its 200 or so resultant recordings formed part of a larger-scale project by the Anthropological Society, carried out with the financial support of the Imperial Academy of Sciences. Apart from providing evidence for numerous minority languages, these recordings – still housed in the Phonogrammarchiv – also contain hitherto unheard-of critical commentaries by the prisoners of war, who had become objects of research under such tragic circumstances. All this underlines the enormous potential of historical recordings as sources for present-day research. One hundred years after their creation, these sound documents, chiefly thanks to the project “Displaced Voices” (funded by the “Jubiläumsfonds der Oesterreichischen Nationalbank”, project no. 15848), were digitised in the Phonogrammarchiv and edited in cooperation with international experts, who supplied scholarly commentaries. Besides the audio CDs with the signal-enhanced recordings, each sub-series of the edition comprises a data CD with scans of the original recording protocols (i.e. the written documentation), transcriptions for orientation as well as comprehensive information on the genesis of the recordings, the researchers and the historical background. In addition, commentaries analyse the significance of the historical recordings from today’s point of view. This English-language publication thus constitutes an important contribution to the discourse of “research in wartime”, throwing a new light on this dark era.